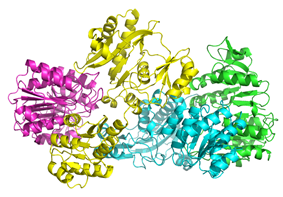 Succinyl coenzyme A synthetase (SCS, also known as succinyl-CoA synthetase or succinate thiokinase or succinate-CoA ligase) is an enzyme that GDP or ADP). It plays a key role as one of the catalysts involved in the citric acid cycle, a central pathway in cellular metabolism, and it is located within the mitochondrial matrix of a cell. Where Pi denotes inorganic phosphate, NDP denotes nucleoside diphosphate (either GDP or ADP), and NTP denotes nucleoside triphosphate (either GTP or ATP). As mentioned, the enzyme facilitates coupling of the conversion of succinyl CoA to succinate with the formation of NTP from NDP and Pi. The reaction has a biochemical standard state histidine residue to remove the phosphate group from succinyl phosphate and generate succinate. Finally, the phosphorylated histidine transfers the phosphate group to a nucleoside diphosphate, which generates the high-energy carrying nucleoside triphosphate. The GTP form is the one more commonly used in the human citric acid cycle. Generation of Nucleoside Triphosphates: SCS is the only enzyme in the citric acid cycle that catalyzes a reaction in which a nucleoside triphosphate (GTP or ATP) is formed by pigeon cells showed that GTP specific SCSs were located in pigeon liver cells, and ATP specific SCSs were located in the pigeon breast muscle cells. Further research revealed a similar phenomenon of GTP and ATP specific SCSs in rat, mouse, and human tissue. It appears that tissue typically involved in anabolic metabolism (like the liver and kidneys) express G-SCS, whereas tissue involved in catabolic metabolism (like the brain, the heart, and muscular tissue) express A-SCS. Formation of Metabolic Intermediates: SCS facilitates the flux of molecules into other metabolic pathways by controlling the interconversion between succinyl CoA and succinate. This is important because succinyl CoA is an intermediate necessary for porphyrin, heme, and ketone body biosynthesis. Regulation and Inhibition: Investigation into the regulation of SCS in E. coli has shown that the enzyme is regulated at the transcriptional level. It has been demonstrated that the gene for SCS (sucCD) is transcribed along with the gene for α-ketoglutarate dehydrogenase (sucAB) under the control of a promoter called sdhC, which is part of the succinate dehydrogenase operon. This operon is up-regulated by the presence of oxygen and responds to a variety of carbon sources. Antibacterial drugs that prevent phosphorylation of histidine, like the molecule LY26650, are potent inhibitors of bacterial SCSs. Optimal Activity: Measurements (performed using a soy bean SCS) indicate an optimal temperature of 37°C and an optimal pH of 7.0-8.0. Fatal Infantile Lactic Acidosis: Defective SCS has been implemented as a cause of Fatal Infantile Lactic Acidosis, which is a disease in infants that is characterized by the build-up of toxic levels of lactic acid. The condition (when it is most severe) results in death usually within 2–4 days after birth. It has been determined that patients with the condition display a two base pair deletion within the gene known as SUCLG1 that encodes the α subunit of SCS. As a result, functional SCS is absent in metabolism causing a major imbalance in flux between glycolysis and the citric acid cycle. Since the cells do not have a functional citric acid cycle, acidosis results because cells are forced to choose lactic acid production as the primary means of producing ATP. ^ Fraser, M. E.; Hayakawa, K.; Hume, M. S.; Ryan, D. G.; Brownie, E. R. (2006). 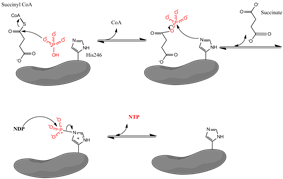 "Interactions of GTP with the ATP-grasp Domain of GTP-specific Succinyl-CoA Synthetase". Journal of Biological Chemistry 281 (16): 11058–11065. ^ Fraser, M. E.; James, M. N. G.; Bridger, W. A.; Wolodko, W. T. (1999). "A detailed structural description of Escherichia coli succinyl-CoA synthetase1". Journal of Molecular Biology 285 (4): 1633–1653. ^ a b Voet, Donald J. (2011). Biochemistry / Donald J. Voet ; Judith G. Voet. New York, NY: Wiley, J. ^ a b c Berg, Jeremy M. (Jeremy M.); Tymoczko, John L.; Stryer, Lubert. ; Stryer, Lubert. Biochemistry. (2002). Biochemistr. New York: W.H. Freeman. pp. 475–477. ^ Nishimura, JS. (1986). 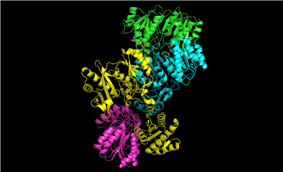 "Succinyl-CoA synthetase structure-function relationships and other considerations.". Adv Enzymol Relat Areas Mol Biol 58: 141–72. ^ a b c Wolodko, WT. ; Kay, CM. ; Bridger, WA. (Sep 1986). "Active enzyme sedimentation, sedimentation velocity, and sedimentation equilibrium studies of succinyl-CoA synthetases of porcine heart and Escherichia coli.". Biochemistry 25 (19): 5420–5. ^ a b c Fraser, ME. ; James, MN. ; Bridger, WA. ; Wolodko, J. (May 1999). "A detailed structural description of escherichia coli succinly-CoA synthetase". J Mol Biol 288 (3): 501. ^ a b Joyce, MA. ; Fraser, ME. ; James, MN. ; Bridger, WA. ; Wolodko, WT. (Jan 2000). "ADP-binding site of Escherichia coli succinyl-CoA synthetase revealed by x-ray crystallography.". Biochemistry 39 (1): 17–25. ^ a b Fraser, ME. ; Joyce, MA. ; Ryan, DG. ; Wolodko, WT. (Jan 2002). "Two glutamate residues, Glu 208 alpha and Glu 197 beta, are crucial for phosphorylation and dephosphorylation of the active-site histidine residue in succinyl-CoA synthetase.". Biochemistry 41 (2): 537–46. ^ Johnson JD, Mehus JG, Tews K, Milavetz BI, Lambeth DO (1998). "Genetic evidence for the expression of ATP- and GTP-specific succinyl-CoA synthetases in multicellular eucaryotes". J Biol Chem 273 (42): 27580–6. ^ Johnson, JD. ; Muhonen, WW. ; Lambeth, DO. (Oct 1998). "Characterization of the ATP- and GTP-specific succinyl-CoA synthetases in pigeon. The enzymes incorporate the same alpha-subunit.". J Biol Chem 273 (42): 27573–9. ^ Lambeth, DO. ; Tews, KN. ; Adkins, S.; Frohlich, D.; Milavetz, BI. (Aug 2004). "Expression of two succinyl-CoA synthetases with different nucleotide specificities in mammalian tissues.". J Biol Chem 279 (35): 36621–4. ^ Labbe, RF. ; Kurumada, T.; Onisawa, J. (Dec 1965). "The role of succinyl-CoA synthetase in the control of heme biosynthesis.". 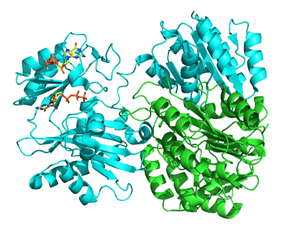 Biochim Biophys Acta 111 (2): 403–15. ^ Ottaway, JH. ; McClellan, JA. ; Saunderson, CL. (1981). "Succinic thiokinase and metabolic control.". Int J Biochem 13 (4): 401–10.